In Focus… that’s a funny title for a week that was spent weaving moifs that are meant to be blurry. My camera kept rebelling against my attempts to have it focus on something that was not sharp and my eyes kept rejecting patterns formed by threads that refused to stay in place. I am talking about ikat. I was weaving the wee sample that I started last week with the new-to-me UKI 20/2 cotton. This would give me an idea of the number of ends I needed to wind for the 7 1/2 -inch width of my next wall hanging panel. At the same time, I was attempting to make this a “two-fer” and try out a new patterning technique using supplementary weft. After finding that my count was off, I unwove the Guatemalan flower pattern I had been creating and then came to the conclusion that a little discipline was needed… a little FOCUS. Sure, I could get a “two-fer” out of this short warp but let’s focus that “two-fer” entirely on the project at hand….ikat with 20/2 cotton. 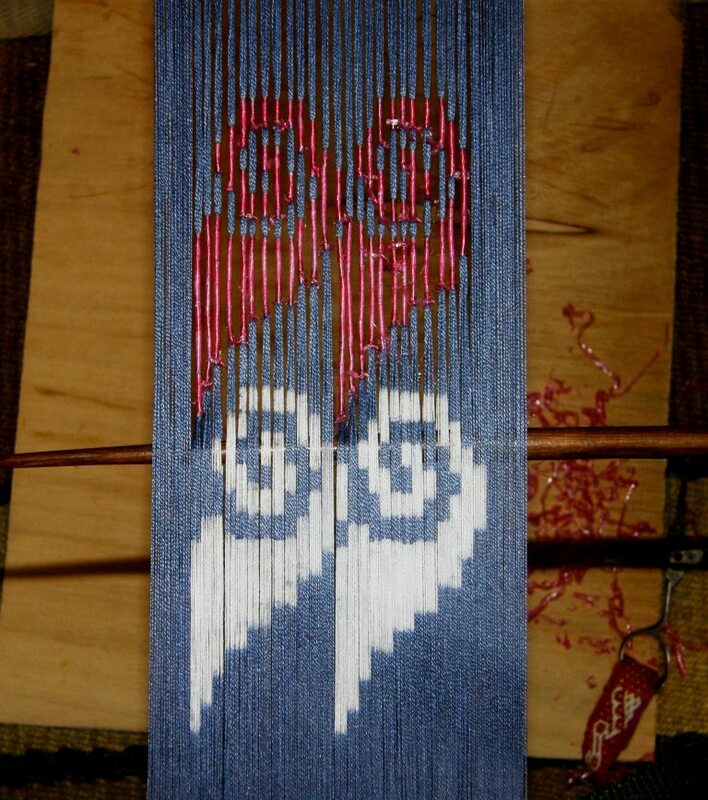 So, I decided to drop the Guatemalan flower project and use this warp as a width sample and also as an opportunity to wrap a sample ikat motif. Above, you can see the last ikat project I did using cassette tape for wrapping. Now I am using tape that has been produced especially for this purpose. I like the cassette tape because it is opaque. 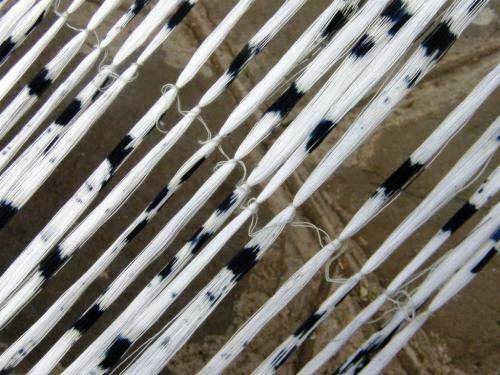 You can immediately see white spots peeking through if you have not wrapped a section well and left parts of the warp exposed. The pink-ish color ikat tape that I have is close to transparent which means that it is far less apparent when I have missed a spot when wrapping. On the other hand, I am enjoying using the ikat tape because I can split and easily the tear the tape into strips of any width I want. While the cassette tape is strong and holds knots well, the ikat tape is even stronger. I haven’t had any trouble with it snapping if I pull a knot very tightly. Above, you can see the sample motifs. This is not exactly the pattern that I plan to use in the wall hanging. The whole thing has been an exercise in achieving consistently accurate measurement of really tiny lengths. It hasn’t been entirely successful so far. In the end, I will be interested to see whether the accuracy at which I have been aiming is absolutely necessary. For eaxample, I simply “eye-balled” the pattern in the project wrapped with cassette tape above. You can see some very obvious differences in the length of the wraps from one motif to the other but the overall look is quite okay. With this latest attempt at ikat, however, I have been measuring and re-measuring and fussing about a whole lot. I have to remind myself to “think like a bird”. I wrote a whole blog post about this once…trying to train myself to walk away and look at this kind of thing from a distance to get the overall effect rather than focusing too much on the finer details. 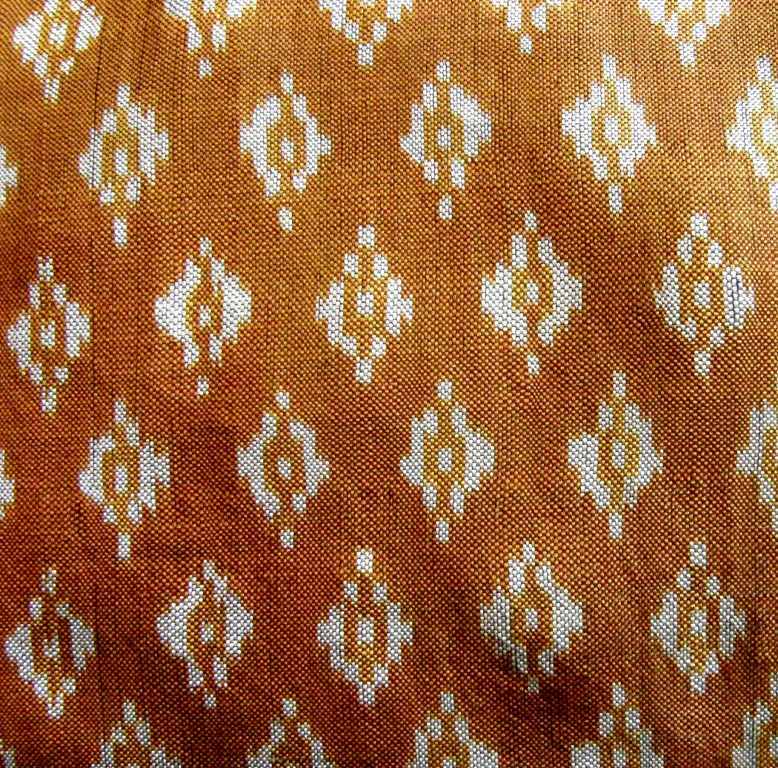 I have a piece of silk ikat from Cambodia as my guide and inspiration. It has a very simple and tiny pattern of blocks. 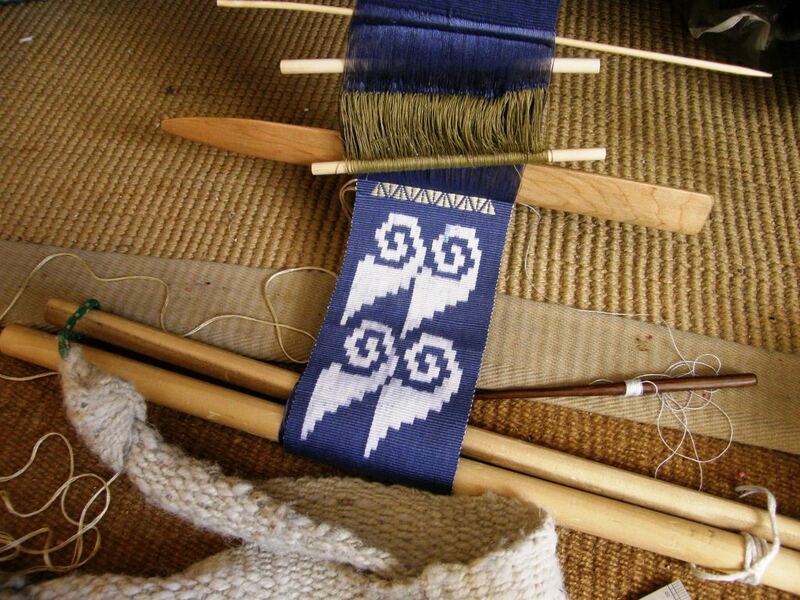 The warps shifted during weaving and, in some cases, a part of a motif has completely separated itself from the rest. Yet, when you stand back and look at this pillow cover, that’s not what you see. You see a simply gorgeous piece of fabric covered with tiny, even motifs. So, I had the warps for my hook motifs wrapped as accurately as I could manage. I told myself that even with accurate measurement and wrapping, the warp threads will most likely shift whichever way they please once released from their wraps for weaving. It was time to stop fussing and move on to the dye pot. There isn’t much that can go wrong in the dyeing part unless you haven’t wrapped tightly enough. It is obvious from looking at some ikat warps that I have encountered in my travels that some weavers do not consider a bit of seepage a problem. The ikat warp below, with its blue pattern on white, is from Tacabamba Peru. There is a heck of a lot of wrapping involved there. All those white parts need to be wrapped in order to expose just the small sections which will be dyed blue. 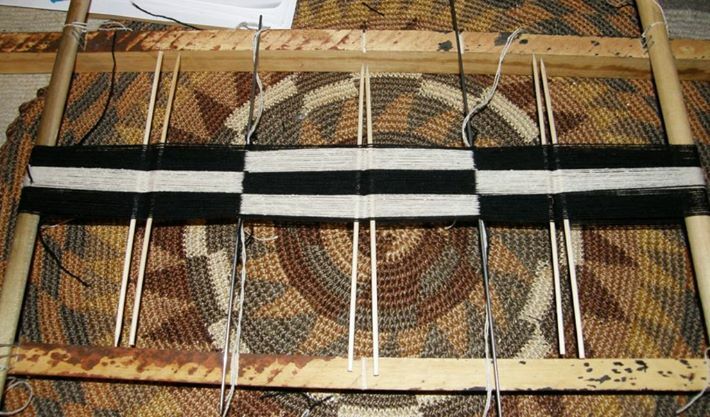 I wish I could have seen this warp before the wraps were removed as I am wondering if there is an ideal length for the wraps. Is there a length after which a wrap becomes unstable thus allowing dye to seep in? Should long sections be wrapped as several small sections instead? You can see several dots and spots where the dye has penetrated the wraps. I was told that Mapuche weavers apply a kind of white mud mixture to the sections of the warp where the dye needs to be resisted. Then they wrap them. When I got to see and touch an example on the loom, white dust would fly when I gently strummed the warps in the sections that had been recently unwrapped. I guess this is an added measure against seepage. As it turns out, my ikat motifs more closely resemble these Mapuche ones with their sharp straight edges rather than the delightfully fuzzy and feathered outlines that one normally sees in ikat work. I dyed the piece blue in a watered-down dye bath of navy blue that produced a shade that I loved. Will I ever be able to produce that shade of blue again?! Darn, I then noticed that I had neglected to add the last wrap on the right to the upper motif. Oh well, it’s just a sample. Above, you can see the warp with its heddles and on its way…..time to unwrap. 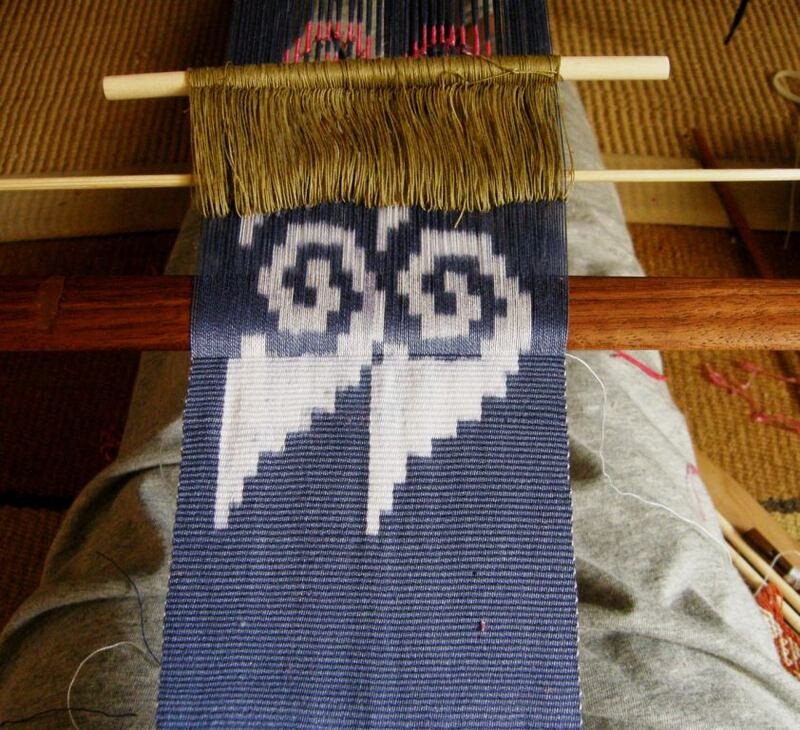 I always take lots of pictures of this part because the next part… the weaving… is where things tend not to go so well. So far so good. Yes, there was a bit of seepage. And I forgot to throw some of the thread in the dye pot to use as weft. Again, never mind, it’s just a sample. I’ll add that to the list of things not to do when I am preparing the real project. 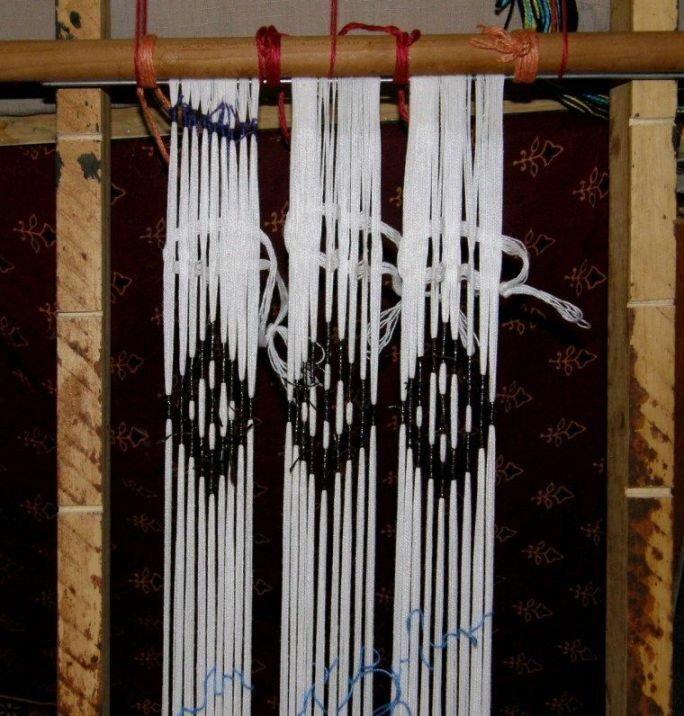 Once I had woven all the ikat motifs, I used this sample warp to test the number of strands of silk I would need to make a supplementary weft that would be suitable for creating patterns on the 20/2 warp-faced ground cloth. 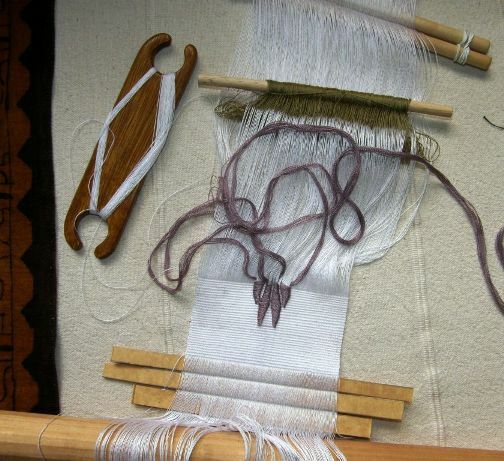 I am hoping to add patterns made with supplementary weft both above and below the ikat section on my wall hanging panel. I love how the buttery-yellow silk weft looks against this particular shade of blue. I must weave something with this color combination soon. I left this sample project at this stage to wind the warp for the wall hanging panel. I figured out the number of warp ends I would need, sketched and refined my ikat and supplementary-weft designs, and have already started wrapping. But, every now and then, I will stop wrapping to go back and weave some more of the sample warp. I need to take breaks like these in order to stay focused. It is too easy to start getting sloppy about the wrapping if you keep at it for too long. When I start wrapping too loosely, stop measuring well, or stop being able to judge a straight line, I know that it is time for a break. If I keep weaving the sample warp, I may even be able to turn the finished fabric into something. In that case, it will be a “four-fer”…a width sample, an ikat tape wrapping test, a silk supplementary-weft test, and a useful, or at least pretty, finished product. 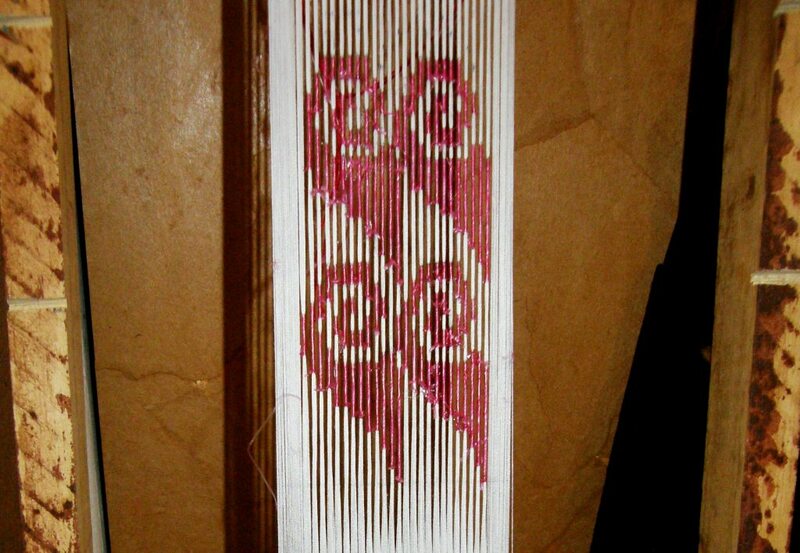 Here is the new warp with a small part of the ikat motif wrapped. I have already had one wake-up call….clumsy handling had me breaking a warp thread right in the middle of a wrap. Luckily it happened now and not while weaving! I was able to replace the thread. It had already been enclosed in five wraps so, those had to be re-done. Can you imagine trying to replace a warp thread once the piece has already been dyed? My kingdom for a fine-tipped charcoal pencil! 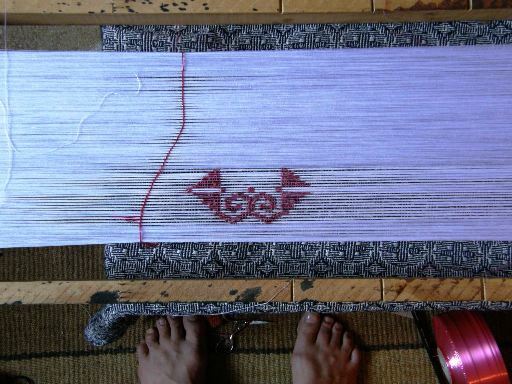 I have read in a few places online about ikat pattern “masters” who mark the motif on the warp with charcoal so that a team of wrappers seated around the warp frame can correctly place the ties. Of course, the charcoal must just wash out later. Now I walk around with static-charged pieces of ikat tape stuck to my clothing. I find it in my bed and in my food! 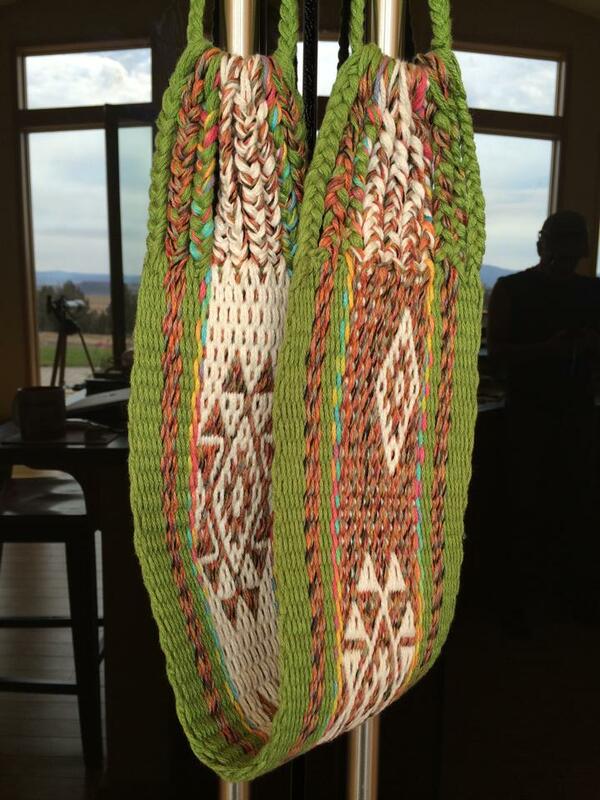 I have a couple of finished projects from friends with whom I wove on my last trip to show. Elizabeth finished her backstrap with Andean Pebble Weave motifs. It looks thick, cushy and comfortable. She used one of the variegated varieties of Plymouth Yarn Fantasy Naturale along with off-white in the pick-up section. I don’t think I have seen Andean Pebble Weave done yet with variegated yarn and I think it looks great! 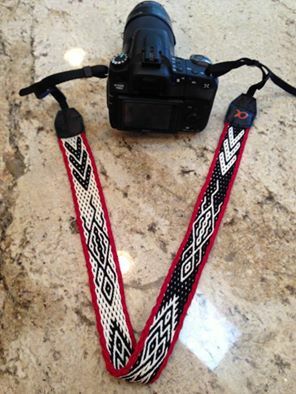 Cheryl finished her camera strap with its Andean Pebble Weave motifs. She used the hardware from an old camera to put this together and it’s beautiful! Back to the wrapping frame for me…tearing strips of tape, measuring and wrapping, and standing back to take it all in. While doing so I will think about what I shall make from my wee sample and what I shall weave into the red panels that will accompany the black-and-white ikat one. I have plenty to keep me focused on this one project! 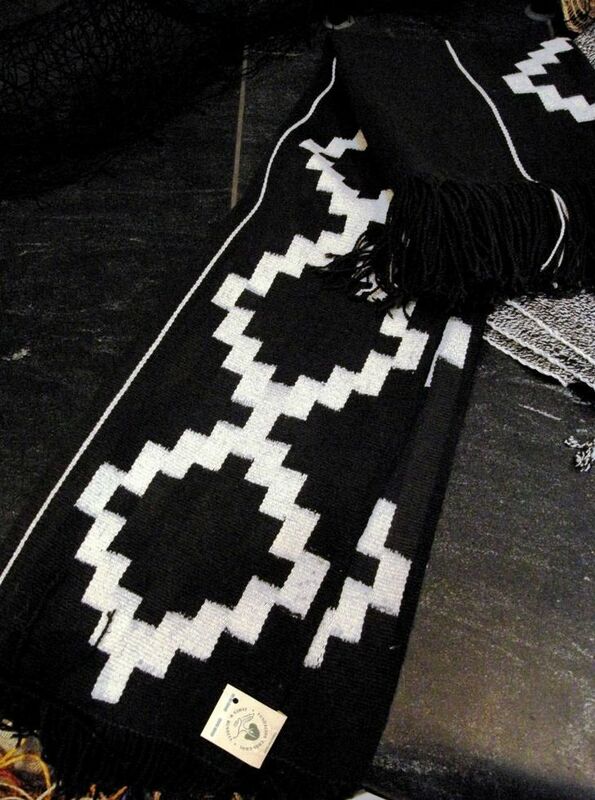 « Backstrap Weaving – Simply Red (and Black and White)! 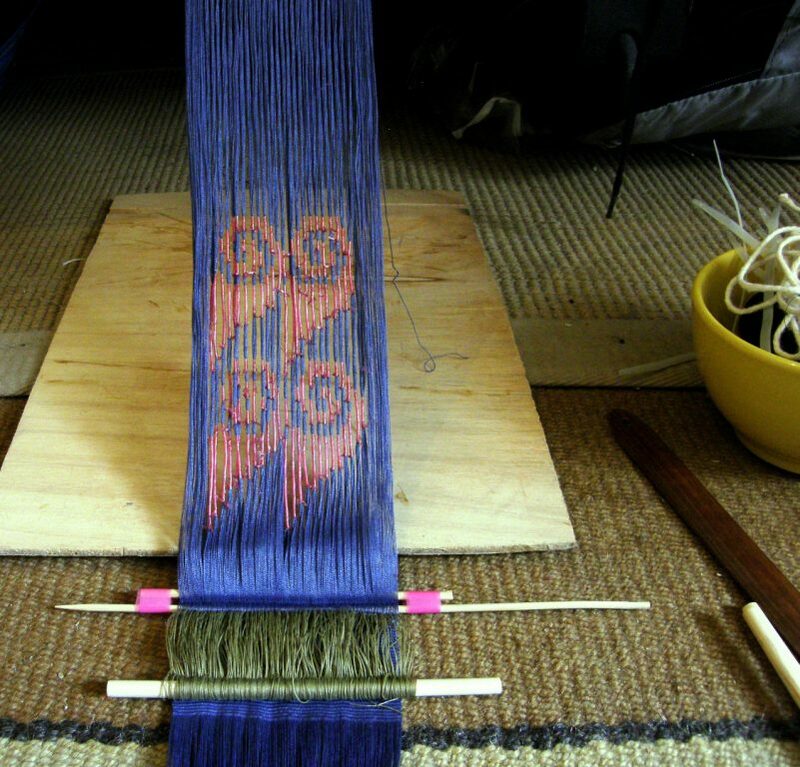 beautiful work on the ikats, that blue is divine! all the best with wrapping this coming week.